The north aisle of the church was not dismantled at the dissolution of the priory but remained in use until the beginning of the nineteenth century. 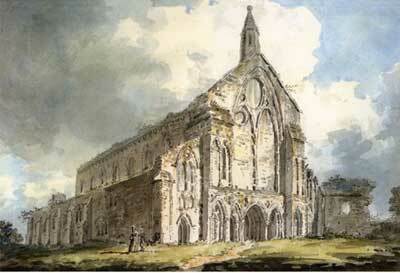 A watercolour by Edward Dayes (died 1804) shows the north aisle still standing, but the west windows of the church and aisle already blocked in. Although the watercolour is undated it is reasonable to assume that it relects the situation towards the end of the eighteenth century. 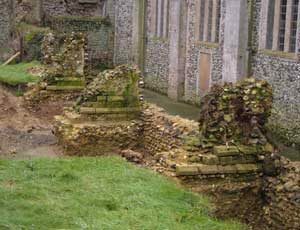 The five buttresses and the final respond have recently been excavated, and it is interesting that no buttresses have been found towards the west end of the aisle. The rather odd architecture shown by Dayes at this end seems to be substantiated by the excavations, but why it is like this is, at the moment, open to conjecture. Note also that the roof of the aisle has already been lowered beneath the line of the west front front of the priory, and this meant that it was necessary to block the triforium windows in. 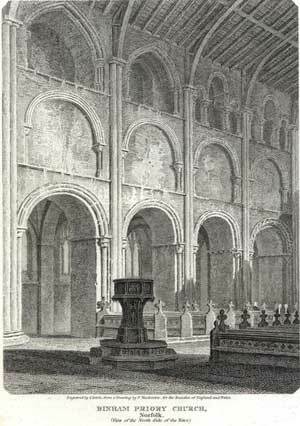 (There is an engraving of 1810 by Samuel Rawle showing the inside of the church with the nave standing and the triforium windows blocked - see below left). In an engraving by Cotman dated 1817, the aisle has been removed and there seems to be a spoil heap in the foreground of the picture. By this time the arches in the church had been blocked up and the windows of the aisle inserted between them. The registers for 1809 record that Baptisms were taking place at Wighton Church while alterations were being undertaken at the church, and this presumably reflects the dismantling of the north aisle at that time. Recent excavationsof the north aisle show the nineteenth century infill of the church walls and the remaining structure of the aisle itself. Like the west front of the church, the aisle walls and the buttresses have footings of flint cobbles. It seems reasonable to assume that before the North Aisle was demolished, the West Front of the nave and north aisle had already been blocked in, the roof of the aisle lowered and the triforium blocked in. The Cotman and Thirtle paintings of the rood screen also show the north aisle standing, and show the lower portions of the windows boarded up. It is probable that the two most easterly bays of the aisle were sectioned off as a Lady Chapel (for pictures suggesting this see the Cotman and Thirtle paintings hyperlinked above). The Church is dedicated to the Blessed Virgin Mary, and the chapel would have been given some prominence. Of what remains of the North Aisle, it is evident that it was divided from the Monastic part of the priory at its most easterly end, by a wooden structure which was held in place by a large beam across the arch, above which were wooden poles fixed into the top of the arch. The present wall in that position is post-dissolution and seems to have been constructed when a small dwelling was erected in the North Transept. On the western side of the second bay there is the remains of a large window which would have added light to the chapel. 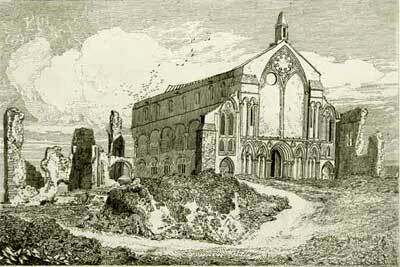 *For Woolnooth's reconstruction of the west front from Buck's picture which was published by Britton, see West Front.